Lithuania is one of the countries that has shown great commitment in the field of violence prevention, and has banned corporal punishment in all settings. The example of Lithuania shows that partnering with the health, justice and welfare sectors makes a significant difference. Workshop participants discussed country profiles from the 2013 “European report on preventing child maltreatment”. Nearly 80% of countries have developed a national action plan to prevent child maltreatment; however, only 4 out of 10 of these plans are funded. Countries are making good progress on strengthening laws. The prohibition of corporal punishment in all settings now covers 62% of countries – an improvement from 47% in 2012. 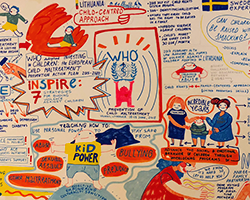 The “European report on preventing child maltreatment” was developed to assess progress in implementing the European child maltreatment prevention action plan 2015–2020. The plan aims for a 20% reduction in rates of child maltreatment in the WHO European Region. Since 2010, child homicide rates have fallen by 11% in the Region. develop and implement properly funded intersectoral action plans to achieve this.